Check out 30 beautiful and ethnic Indian outfit ideas to flaunt this Navratri! It is time once again to spruce up in the chicest of ethnic wear and classic Indo-western wear while you dance away the night with family and friends at the Navratri gatherings. Plenty of fun for sure, and to help you have more fun this Navratri, here are 30 stylish outfit Ideas for the occasion of Navratri. Seek inspiration and get in touch with your master tailors or designers for the same. 1. 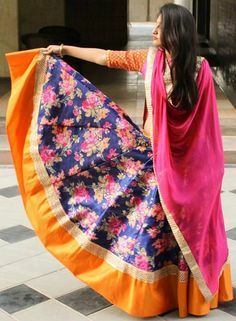 Kutchi embroidery cholis: What we particularly like about this choli is that it can be worn with a net saree or a chic pair of gotta patti embossed dress pants. You could also style the Kutchi embroidered cholis with chic cotton garba gowns, long white skirts, cigarette pants or palazzos too. And to be the desi swagalacious diva around, the nine-yard saree is what would do justice! 2. Lehengas and skirts anyone? Flaunt the feminine touch and bring about the sensual look that make heads turn at the Navratri gatherings, wearing mirror work lehengas and ghagras. Here are five inspirations to take a cue from! Pair them up with simple cotton white dress shirts, mirror work cholis, backless tops, crop tops et al, and get ready for the compliments to pour in! 3. Sleek dhoti pants: Dhoti pants have been endorsed by our Bollywood celebrities very often, and it is time for you to stay fashionable, chic and yet comfortable moving around while the Navratri celebrations are on. Dhoti pants are best paired with crop tops, peplum tops, kurtis, long coats or cotton salwars too! 4. Anarkali suits: Be the Anarkali that burns the dance floors not only at the discos but the cultural gatherings too. Anarkalis can be traditionally worn or with an Indo-western fusion too. You can pair them with silk trousers, or can get a pre-draped dupatta stitched on the Anarkali for that X-factor, or can simply wear a tube Anarkali, which will give you an overall gown effect. Here are some choices to seek your ideas from! 5. A-line salwars: Should you want to keep it a little low-key and yet make a fashion statement too, the A-line salwar tops can be paired with palazzos, dress pants, ciggy pants, leggings or harem pants too. Simple yet chic, stylish outfit ideas galore when you play with A-Line suits. 6. Sarees for sure: The sensuality of sarees cannot be underestimated and should you want to make a desi swag splash at the event, wearing mirror work sarees should be the aim! Colourful, bright and vibrant with plenty of embellishments too, saris can make plenty of heads turn at the events ahead. 7. Chaniya cholis for the evening: There are chances that you would be invited to grace many occasions and events while the Navratri days are on and in full-swing. One of the quintessential fashion statements and Haute outfit ideas to flaunt at such gatherings would be the colorful and shiny chaniya cholis! With plenty of shine, shimmer, accessories and bling, tassels and colors too- shine away and steal glances too! Well, here were some of the best outfit ideas we scourged and looked around for you to seek inspiration from. Do let us know about your fashionable ideas for Navratri this time, and should you want to send us a suggestion or ideas on the same, please feel free to do so. Happy Navratri and Goddess Bless!